Vietnam offers travellers the best and the worst of the internet – very often at the same time. On a good day, Vietnam offers world class and inexpensive 3G mobile and broadband internet services to travellers. And the internet’s easy to access too. Mobile data and call plans for travellers are available for sale at Ho Chi Minh and Hanoi airports. Ubiquitous cafes, restaurants and bars offer free wifi. But there are bad days. And they seem to be occurring more frequently and with increased severity. On a bad day, travellers get to take an involuntary journey back to the pre-internet era, or the dial-up days of the 1990s. Vietnam’s internet is a fickle and confusing thing. It’s pervasive – from 3G mobile services that reach to some of the most remote areas of the country, to fibre broadband services that, at their best, shame the far more expensive services I use in Australia. You’ll struggle to find a cafe, bar or restaurant anywhere in Vietnam that doesn’t provide complimentary, easily accessed wifi. With the exception of one or two international hotel chains, free wifi is standard at Vietnam’s hotels and resorts. So far so good. Vietnam’s sounding like one of the world’s most internet friendly places for travellers – far better in fact than many more developed travel destinations. And the Vietnamese people love the internet. There are more than 40 million internet users in this nation of 90 million. That’s a lot of customers for the country’s telcos. Vietnam’s internet penetration is very high in relation to its economic development too. So what’s the problem? Well there are a few. Vietnam has frequently been listed as one of Facebook’s fastest growing markets. But there’s an official ambivalence about the US social network. Access to Facebook can require a little finessing – at least on a desktop. Vietnam runs a low level block on Facebook that can require DNS setting changes or a VPN to circumvent. As I say though, it’s a low level block and it’s easy to get around. It’s nothing like the severe block China’s Great Firewall imposes on Facebook, YouTube, Google and other US tech giants. And curiously, mobile services are exempt from Vietnam’s blocks. If you’re using your mobile, you can usually expect stable access to Facebook. Twitter’s situation is also a little complicated. Some local ISPs seem to block it occasionally. Like Facebook, these blocks only seem to hit desktops. I’ve never had a problem accessing Twitter on mobile. Unlike Facebook, Twitter has very low user penetration in Vietnam. Other social networks including YouTube, are popular and accessible in Vietnam. International news, current affairs and other English language sites enjoy reasonably clear access in Vietnam as well. That’s as long as you don’t want to read about Vietnam while you’re in Vietnam. Sometimes individual news pieces from the BBC and other international news and current affairs broadcasters are blocked. But most news coverage seems to make it through. 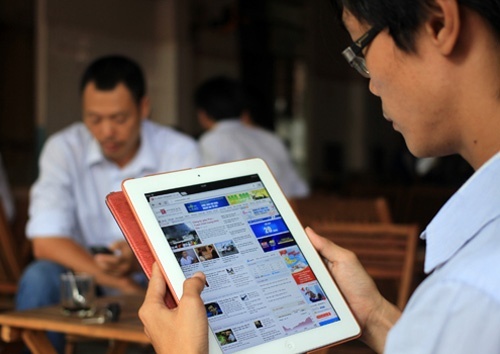 Vietnam is listed by Reporters Without Borders as an “enemy of the internet”. This is because of the harsh way the country treats its dissenting bloggers and journalists – rather than anything likely to impact on the internet experience of travellers. Vietnam’s more heavy-handed internet censorship applies mainly to Vietnamese language sites and so isn’t likely to impact travellers either. Probably the biggest internet headache travellers face in Vietnam is frequent disruption to the country’s perilously fragile international marine fiber cable. Over the past few years, these disruptions have become increasingly frequent and can render access to international sites slow or impossible. Much to the amusement of locals and foreigners, sharks are often blamed for these ocean cable ruptures. Information on the failures tends to be incorrect or contradictory, leaving plenty of space for Vietnam’s hyperactive legion of conspiracy theorists to speculate on what is really happening. Whatever the cause, the inconvenience to travellers is trivial compared to the brake these outages put on Vietnam’s productivity. They usually last for several weeks. And Saigon’s just come out of the worst outage I’ve experienced. The official line is that new cables will be connected in 2016 removing this over-dependence on a single cable. Given that Vietnam is located in one of the busiest internet corridors in the world, many have asked how this vulnerability could have been allowed to plague the country for so long? So if you’re travelling to Vietnam, expect pretty good, inexpensive, internet access – unless you’re here during one of the country’s infamous and all too frequent outages. Local prepaid SIM cards are available at Saigon and Hanoi airports and are also widely available in cities and towns if you’re arriving overland. Viettel, which is owned by the military, seems to have the most extensive network and is the country’s biggest mobile provider. Vinaphone and Mobifone are also popular and have good national coverage. Some of the major companies have SIM card plans tailored to the data and call needs of travellers. At time of writing, 3GB of mobile data can be purchased for around 200,000VND.